Video: I talk about writing and indiepub at Doctor Who convention! As you likely know by now, I spent last weekend at a Doctor Who convention. It was a fantastic opportunity for me to promote my book and meet with sci-fi fans. I got a lot of positive feedback and made some wonderful connections. The cameras were rolling, and my fantastic host Natalie Buske Thomas provided me with the video in which I appear. OK, trainwreck is a little harsh. I did clearly struggle with the Doctor Who question. I love Doctor Who but I can’t honestly say it influenced me except in the slightest of ways. I think I did a little better with the writing questions. This might be my first book but I’m a professional journalist and have been writing a long time, so I have a lot to say. 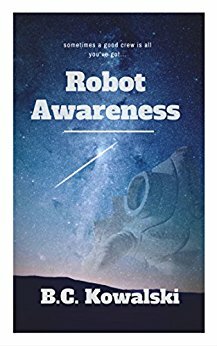 Previous Robot Awareness on Facebook! Nice job promoting your book. Now I really can’t wait to read it next week. Thanks Dawn! I can’t wait to see how you like it!